Most major cities in the U.S. have a sandwich that locals proudly claim as their own. For Chicagoans that sandwich is the Italian Beef. Thin-sliced roast beef is dunked in herbed gravy to soak up the flavor, then it’s stacked on a warm Italian sandwich roll and topped with sweet peppers or spicy hot Giardiniera. The recipe may seem like a simple one, but if any component of this iconic sandwich isn’t faithful to the Chi-Town original, true beef fanatics will cry “foul” quicker than bleacher bums at Wrigley field. There are many good Italian Beefs to be had in Chicago. Great beefs are produced every day in small corner joints with names like Bubba’s, Johnnie’s, Jay’s, Tony’s, Pop’s and Mr. Beef. And there are top level chains with beefs so good and business so robust that they have exploded into multiple locations across the city, and even into other states. Al’s Beef, Buono Beef, and Portillo’s are such superstars. You’ll get truly fantastic Italian beefs at any of these popular restaurants, and any of them would be great hacks. But since Portillo’s is the largest, with 41 locations across the country and more to come, that’s the Italian beef sandwich I’ll be hacking here today. And this is the easiest method you’ll find. You won’t need to spend hours roasting meat, making scratch gravy, and then trying to slice the beef thin enough by hand without losing a fingertip. I’ve got a gravy hack for you that shortens the process considerably, and we’ll let your deli clerk handle the sharp blades. A good sandwich is only as good as the roll it’s built on. Portillo’s uses Turano rolls which are tough enough to withstand some heavy gravy pours and dunks. If you can’t find Turano, look for Gonnella rolls which are nearly identical. You can also use Amoroso rolls from Philadelphia which are longer, softer, and typically used for cheesesteak sandwiches (a.k.a Philly’s favorite sandwich). They don’t hold up as well to liquid as the other rolls, but they taste great. If you can’t track any of these down, use the chewiest French rolls you can find. As important as the roll is what goes into your roll. Portillo’s uses thinly-sliced bottom round roast beef, which is the tougher of the two (top and bottom) back end round cuts. For this hack you’ll need to get freshly sliced roast beef from your deli. It will likely be from top round cuts (as these are), which means it will be more tender than the bottom round used at the beef shops, and that’s a good thing. Get your beef in any of these these preparations: regular roast beef (or Angus), London broil, or Italian-seasoned beef. They all work fine, but the Angus roast beef is the best of the bunch. Whatever you decide to get, you’ll want a pound of it. Tell your deli clerk to slice it thin. As thin as possible. When the beef is thin it stays tender and you can use more slices on the sandwich. Which means the meat holds more gravy. Which means you get a more flavorful sandwich. Which means more happy mouths. If the beef starts to tear and won’t slice into whole clean slices, have your deli clerk go a little thicker until the slices come out clean. 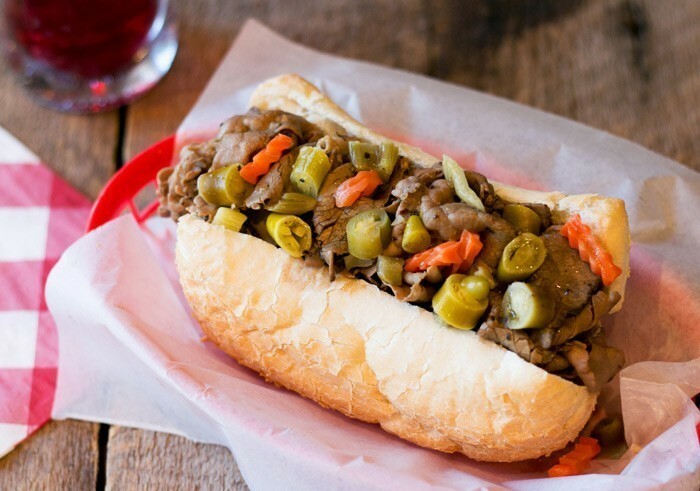 It’s not an Italian beef without the added burst of flavor that comes from the peppers on top. Marconi brand hot Italian giardiniera is a spicy blend of pickled vegetables that includes peppers, carrots, celery and cauliflower in an oily brine. Marconi is the brand Portillo’s uses, but you can use any brand you prefer, including milder varieties. Giardiniera is the most popular topping and it’s the way I roll, but it’s pretty spicy stuff and you may want something milder. In that case, find or make some sweet peppers. The sweet peppers can be prepared by roasting sweet bell peppers and adding a little vinegar to them, or you can use a canned product. Let’s begin cooking with a magic trick. We want to make beef gravy that tastes like it was created in the traditional time-sucking method usually requiring hours of roasting and reducing. Rendered fat is a important component of long-form beef gravy that is created as the beef cooks over several hours. We do want fat, but we want it quick. To do that we’ll turn these solid beef fat trimmings (a.k.a. suet) into liquid fat (a.k.a. tallow) in the quickest way possible. Get some fat trimmings from your butcher (cheap!) or trim them from uncooked beef steaks and roasts. You can do this over time and save the trimmings in your freezer. You only need 1/4 pound for this. You can’t beat a food processor for chopping up the fat into little bits. Just be sure your fat trimmings are cold before they go in to help get it chopped into small pieces. Put the fat in your freezer for 1/2 hour if you want to chill it quick. Chop the fat until it looks like this. If you don’t have a food processor, you can chop the fat by hand with a knife. Your pieces won’t be as small, and the cooking will take longer, but the fat will still render. Now cook this down, stirring often. It’ll crackle and pop, and soon you’ll have enough fat for the gravy. Separate the fat from the browned bits. This is where your strainer comes in handy. Save the fat for the gravy and toss out the browned bits. Now that have our fat, we need to combine all of the ingredients for the gravy in a saucepan of water. The gravy is made with two large Knorr bouillon cubes, Kitchen Bouquet for color, oregano, salt, pepper, garlic, cayenne, MSG (not bad for you), some lemon juice (not shown) and 3 tablespoons of the rendered fat. These ingredients are what you find in the real gravy as listed on the plastic tub it comes in. I know this because Portillo’s ships frozen Italian beef kits, which I ordered; and the law requires ingredients to be printed on the package when sold as a shipped retail product. I found that most other Portillo’s beef copycats include random ingredients like Worcestershire sauce, basil, and salad dressing mix (? ), while leaving out essential additions like ground cayenne or umami components that are listed right on the package. Mix all this together, cook for 5 minutes, and you’re done. That’s it. You won’t believe how good it is. Now preheat your oven to 400 degrees. When you’re ready to build each sandwich, warm the rolls in the hot oven for 3 to 4 minutes. This will make them crispy on the outside and warm in the middle. While the bread is warming up give your beef a hot gravy Jacuzzi bath. First, be sure your gravy is not boiling. It should be just below boiling (around 180 degrees is good) so that the beef doesn’t toughen as it soaks. Separate the slices of beef and add them to the gravy for 2 minutes. Use tongs to add the beef into the sandwich roll. Don’t let the gravy drip off. You want the beef wet and flavorful. We’ll also add more gravy at the end. Some people like the whole sandwich dunked in the gravy. Now’s the time to do that. Use tongs and dunk it real quick if you decide to go for it. Now add some peppers on top. Oh, that’s nice. I can practically smell Lake Michigan. Finish up your masterpiece Italian beef sandwich with more gravy over the top, and dig in. Chicago is now in your house. Most major cities in the U.S. have a sandwich that locals proudly claim as their own. For Chicagoans that sandwich is the Italian Beef. Thin-sliced roast beef is dunked in herbed gravy to soak up the flavor, then it's stacked on a warm Italian sandwich roll and topped with sweet peppers or spicy hot Giardiniera. The recipe may seem like a simple one, but if any component of this iconic sandwich isn't faithful to the Chi-Town original, true beef fanatics will cry "foul" quicker than bleacher bums at Wrigley field. Render the beef fat by chopping it into small bits (about the size of peas) with a food processor. Be sure the fat is very cold--it will chop better. If you don't have a food processor, you can chop the fat by hand. Use a sharp knife and cut it as small as you can. Heat up the fat in a sauté pan over medium heat until the bits are browned. Strain the solids from the fat and measure 1/4 cup of fat for the gravy. Make the beef gravy by combining all of the ingredients, including the beef fat, in a medium saucepan over medium heat. When the mixture begins to boil reduce the heat and simmer for 5 minutes, then turn the heat to low. Make the sandwiches by heating up the rolls in the hot oven for 3 minutes. For each sandwich, drop 1/4 pound of sliced beef (separate the slices) into the gravy for 2 minutes. Make sure the gravy isn't boiling. It should be around 180 degrees F. After the beef has soaked in the gravy, use tongs to arrange the beef on a warmed sandwich roll and top with your choice of hot giardiniera or sweet peppers. Or both. Spoon on some extra gravy just before serving. How did you cook the pre-sliced beef? It’s already cooked. It just needs to get warmed up in the gravy. I made this today and it was spot-on! The flavor was just like I remember. My only issue was the texture. Instead of light and fluffy beef, it was heavy and clumpy. The “butcher” was my local chain grocery store and that was probably my mistake. He didn’t trim the fat like I asked and ended up shaving it. Next time, I’ll go to a professional. I will definitely make this again. Thanks for the recipe. I’ve been craving a Chicago style beef sandwich for so long that I’ve even had dreams about them. One of the best I had was from a place called Mr. D’s on Diversey Avenue. I had friends who would drive in from Naperville, Palatine and other suburbs just to get his beef sandwich. He also made a great Double Cheeseburger. I’m definitely going to try and make this beef sandwich. I’m going to hack your hack. In California I’ve been BBQing Tri Tips since I was first learning to cook. You may need to ask for them in some areas but all cows have the same muscles. Generally I buy untrimmed multi packs when they’re on sale and freeze some of them. Often make Philly Cheese Steak out of left over meat. Today i was craving Italian Beef but the only place that made them here has closed. Trimmed the cooked fat(already seasoned with salt pepper and garlic powder) and chopped in food processor as you suggest. Got a little more than 1/4 cup of rendered fat. So I’ll let you know how it turns out. By the way, in my opinion, three cooking essentials are Food processor(got mine for around $40 at Home Depot), Slicer(mine is a Krups. Less than $100 and I got about 75 slices from 1-1/2 pounds of cooked beef) and a vacuum food storage to prepare food for freezing(around $135 at Costco). Does it have that unique smell & taste that Portillos has over others (Als, etc..)?? I haven’t been able to isolate the spice that makes it different than other Chicago beefs. This was a HUGE hit at our football watch party last night and it was the easiest to make!! The hardest part was finding the bread and hot peppers(I ended up using french rolls from the grocery store, and found Giardiniera peppers at an Italian deli in the next town). I doubled the recipe and had so much extra gravy that I froze it to reuse for another time. There were small pieces of Roast Beef left from the dunks, which Im sure will make the gravy extra delicious for next time! Thanks for sharing this recipe!!! Quick Question: how far in advance can I make the beef and peppers part? Make the gravy and peppers a day or two in advance if you like. When you are ready to build sandwiches, heat up the gravy and rolls, then dunk the beef, stack and serve. Incredibly delicious! I am amazed! I live in Northern Minnesota and several hours away from the wonderful Portillo’s. When we left the Chicago area, it was a sad goodbye to these yummy sandwiches. Until now! I have some Turano bread in my freezer. This is as close as to the real deal with the freshly baked Turano bread, Portillo Beef Sandwiches as you can get. I can’t wait to serve them to my family and friends. Salute! Love Portillo’s. Now I can make it at home. 🙂 I had even gone out and bought a deli slicer just to make my own Italian beef sandwiches. There use to be a food truck here in DC that served them. Now I make them. 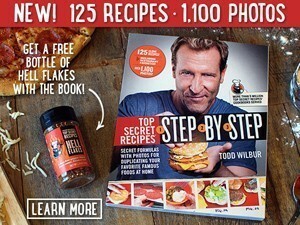 These instructions are picture perfect! Thanks! Off to the store I go!